This high resolution spectrograph allow to visually watch the solar spectra with lot of fine details. This is an ideal instrument for clubs and association who organize astronomy days for the public - always interested to better understand messages from the light. 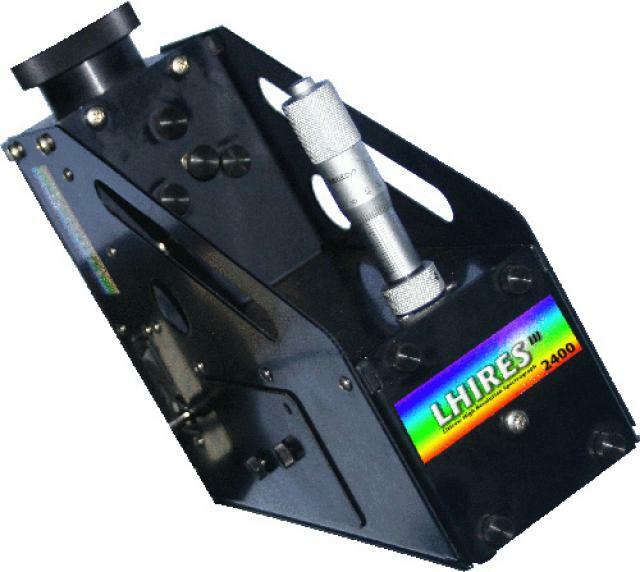 Lhires III spectrograph has been designed for small telescope (typically 8" f/10 telescope) and is then perfectly adapted for backyard astronomy. It can be setup in numerous instruments and you can use several type of CCD camera, webcam, or SLR cameras to record your own spectra. But Lhires III is also a perfect tool for studying the sky. Students from several universities are learning from this spectrograph. Its design is powerful but simple and one can easily open it to see inside. Assembling the spectrograph is also very educational. Easy to use, it allows practical astrophysic on small telescope. With the mirror slit, the Lhires III is very easy to use and allow to center and maintain the target into the slit with great precision. A simple webcam allow to guide on bright star. You get the full control of the operation during the exposure and you do not need a state of the art mount to do spectrography! Almost all CCD cameras, SLR cameras, or simple webcam can be mounted on a Lhires III. Very convenient: optional grating and support are available to adapt in few seconds your resolution to your project. Fainter objects are accessibles: novae, bright comets... See our performance page.